An Australian passenger plane with 203 people on board has been forced to make an emergency landing after a fire broke out in the cockpit. The Airbus A330-200 operated by Jetstar was flying from Japan to Australia when the fire started beside a window. The pilots managed to extinguish it before landing in Guam. Jetstar said all of those on board were unharmed. Last week, an Air France A330-200 on a flight from Brazil to France crashed, killing all 228 people on board. Also on Thursday, a Russian Airbus A320 was forced to make an emergency landing after its windscreen cracked. The Aeroflot plane was flying between Irkutsk and Moscow when it had to divert to the western Siberian city of Novosibirsk. None of the 116 passengers and six crew was injured, a security official was quoted by Russian news agency Ria-Novosti as saying. David Epstein, an official from Jetstar's parent Qantas Airways, said an electrical connector for the heating system had gone wrong, but the situation had quickly been brought under control. Such incidents are not uncommon, he said, adding that it did not raise new safety concerns about the A330-200 model. 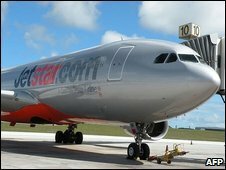 Jetstar is owned by Qantas.